Description: Front cover has circled paw with text "Limited Edition" in upper right corner. Text on front reads: "Includes: Dalmation, Boxer, German Shepherd Dog, Golden Retriever, Yorkshire Terrier, Beagle"
Box Text: Chihuahua, Dachshund, and Lab versions also available! All breeds unlockable in every version! Give a puppy a new home inside your Nintendo DS! Your favorite breed is waiting, so take one home with you then care for and train it using the Touch Screen and Microphone. Pet your puppy! Use voice commands! Play with toys! Meet other Nintendogs using wireless Bark Mode! 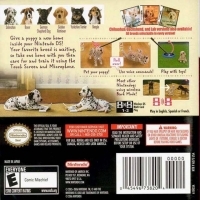 This is a list of VGCollect users who have Nintendogs: Dalmatian & Friends - Limited Edition in their Collection. 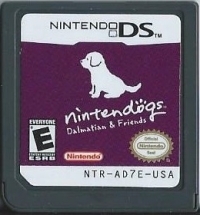 This is a list of VGCollect users who have Nintendogs: Dalmatian & Friends - Limited Edition in their Sell List. 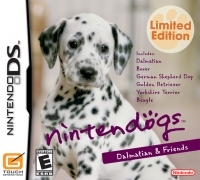 This is a list of VGCollect users who have Nintendogs: Dalmatian & Friends - Limited Edition in their Wish List.